Posted 2014-06-17 by Plastic2go in Plastic Crates. 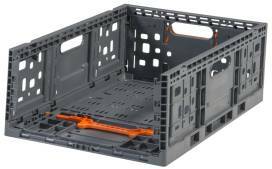 As with all of our products, these return packaging plastic crates combine ergonomic design, low weight, ease of folding and unfolding, card holders and a range of other features. They are UV stabilised, can be steam cleaned and are very durable. They are also environmentally friendly, being fully recyclable, and compliant with the strictest occupational health and safety.